So many things have been happening lately, I feel like Im going around in circles.. Here are some pics from the whitebaiting.. The first week was not good, extremely cold, and the odds were ten cockabullies to each whitebait caught. The last 3 days the tides were on the rise and we had 2 really good catches, then the rain came and the river flooded..This is when you should really be keeping an eye out as all the gear has to be taken off and the stand winched up (bottom row middle pic). We had a bit of a hiccup where Charlie had to go out on the jetty part as a log had got caught up in a rope that should of been brought in, another Lesson Learnt. I must admit I did not like seeing him out there with raging waters under the walkway... A bit like walking the plank but at least he had the hand rails. One day I thought I could smell Roast Pork cooking, but obviously I was dreaming. Things like that happen when you are away in the wops lol. 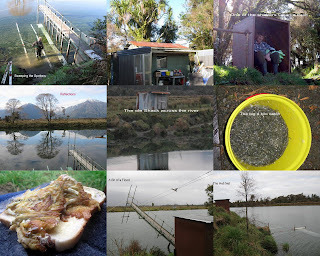 The next day I am watching the net and I smell whitebait cooking, no dreams this time, the whitebait sandwich was produced with a lovely hot Cup a soup. Good on you Charlie, Nom Nom, you cant beat that..
From home to the Turnbull River is 697 kms thats a fair hike, for me and Poss all in a day. Thanks to my awesome CD Player, the set of 3 from Esther, and some of my favourite cd's, it makes the trip much nicer. I admit tho to having to really focus on Road Works, Trains (huh), One way bridges, and the speed limit lol. Home safe and another story about to be released..
Love the photo collage Brenda! So glad you still like the cd's. Bet you sing the Barbie one at the top your voice, haha! 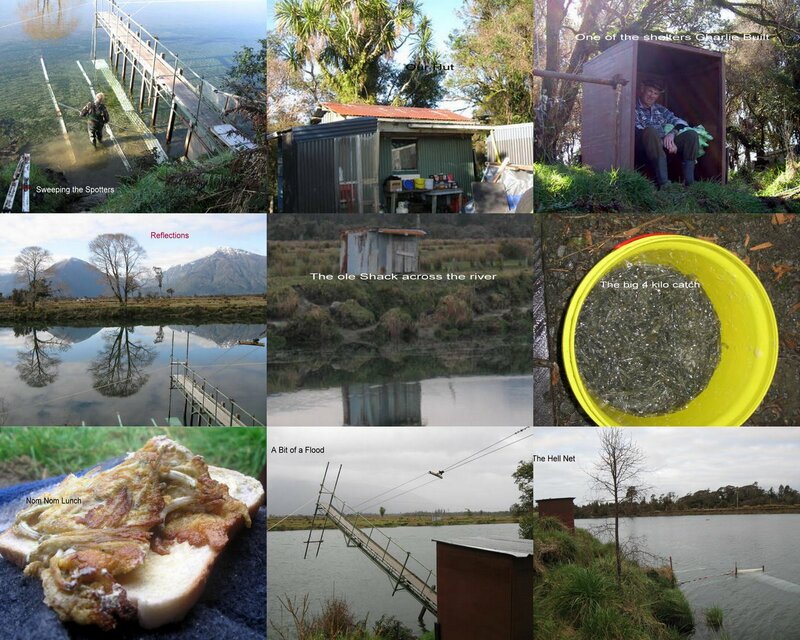 Aw look at that ... is that a whitebait stand? Do you sell much off that loling!! !